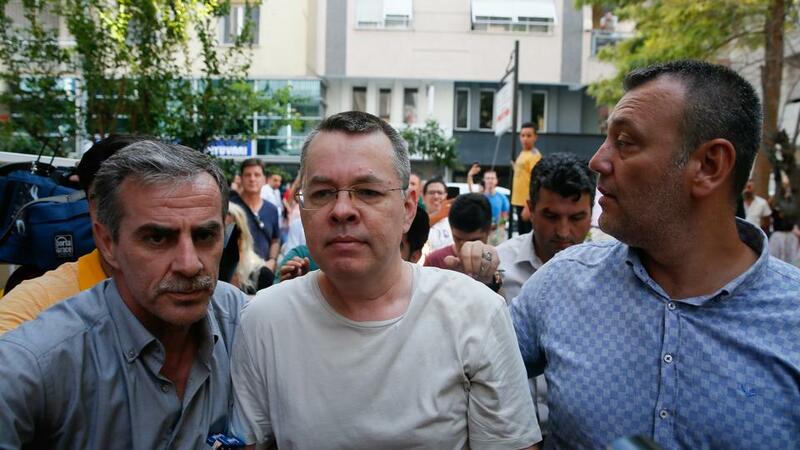 Tensions rise between Turkey and the US over Andrew Craig Brunson, who was charged by a Turkish court with committing crimes, including spying for terrorist groups. The US will impose sanctions on two Turkish officials over a detained American pastor who is being tried on espionage and terror-related charges, the White House announced on Wednesday. President Donald Trump warned last week that he might impose sanctions against Turkey, a key NATO ally, for its treatment of Andrew Craig Brunson. Brunson, who was recently released to home detention, was charged with committing crimes, including spying for the PKK, which is listed as a terrorist group by both the US and Turkey as well as the EU. He is also charged with helping the Fetullah Terrorist Organisation (FETO), the group behind a coup attempt in July 2016. If found guilty, Brunson faces up to 15 years in prison for committing crimes on behalf of terrorist groups without being a member, and up to 20 years for political or military espionage. White House spokeswoman Sarah Sanders said the sanctions would target Turkey’s justice and interior ministers, whose agencies she said were responsible for the pastor’s arrest and detention. “We’ve seen no evidence that Pastor Brunson has done anything wrong, and we believe he is a victim of unfair and unjust attention by the government of Turkey,” Sanders said. Secretary of State Mike Pompeo said the Turkish government refused to release Brunson “after numerous conversations” between President Trump and his Turkish counterpart Recep Tayyip Erdogan along with his conversations with Turkish Foreign Minister Mevlut Cavusoglu. “President Trump concluded that these sanctions are the appropriate action,” Pompeo said. A Turkish justice ministry spokesman did not immediately comment on the sanctions. Turkey’s Foreign Ministry was expected to release a statement later on Wednesday. TRT World was joined by Jon Brain in Washington DC and Andrew Hopkins in Ankara for the latest.